R.E.D is a Perth business invested in and concerned with building a better, stronger and vibrant dance community in Perth. R.E.D. aims to bring the international dance world to the door steps of local Perth dancers. Owned and run by Perth locals, R.E.D. has a vested interest in the betterment of the Perth dance community. 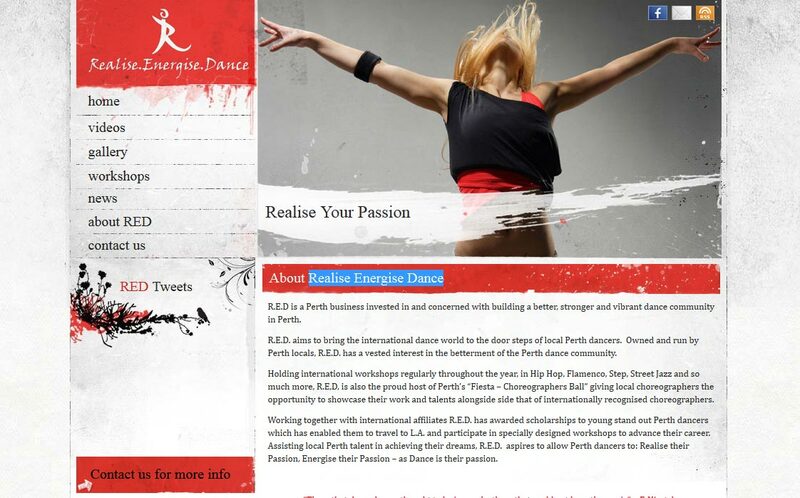 Holding international workshops regularly throughout the year, in Hip Hop, Flamenco, Step, Street Jazz and so much more, R.E,D, is also the proud host of Perth’s “Fiesta – Choreographers Ball” giving local choreographers the opportunity to showcase their work and talents alongside side that of internationally recognised choreographers. Working together with international affiliates R.E.D. has awarded scholarships to young stand out Perth dancers which has enabled them to travel to L.A. and participate in specially designed workshops to advance their career. Assisting local Perth talent in achieving their dreams, R.E.D. aspires to allow Perth dancers to: Realise their Passion, Energise their Passion – as Dance is their passion.